Make knives for the pleasure of buyers and my personal pleasure by giving the best of myself to each of my knives, with regard for the best materials and the best manufacturing techniques. 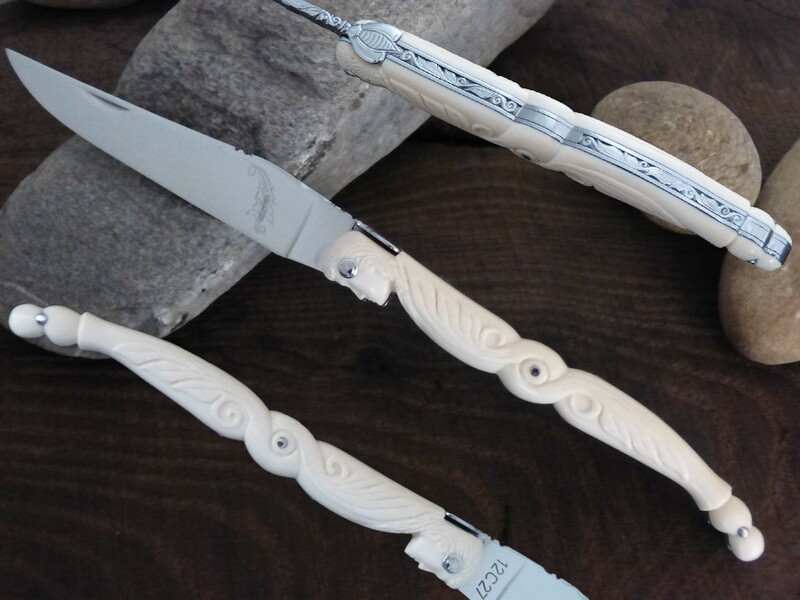 I sculptured the handle with for theme "Belle de l'Aubrac" of a face in the fine lines and a sculpture of two interlaced leaves agreeing perfectly with the sophisticated line of the knife. The spring is massive and forged, engraved of decorative leaves and a very finely worked bee. The bee is an integral part of the spring. The steel of the blade is Swedish sandvik 12c27 stainless steel which I finely engraved of a leaf of acanthus. The finish is shiny.